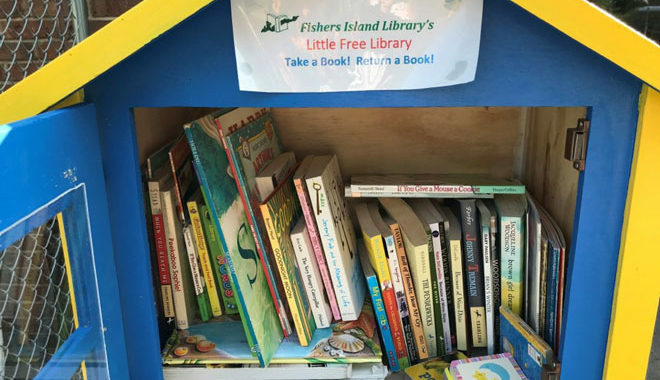 The Fishers Island Library is proud to announce its first Little Free Library at the rear entrance to the Fishers Island School. It is stocked with books for children of all ages — board books, picture books, first readers, chapter books and young adult fiction. Its motto is: “Take a book, Return a book.” It’s open to everyone, it’s free, and there are no return dates. Take any book you want, share a book you think others would like to read, bring joy to your fellow Islanders! A special thanks to the high school shop classes of Jared Kaplan who built our first Little Free Library, with the active encouragement of Principal Christian Arsenault and materials we provided.